This is a very common problem, and the answer really depends how stained as to how instantly the original colour can be retrieved. With mares, the urine will obviously stain the tail, but if it is washed very regularly and conditioned - at least every week - then this will then not allow the stain to penetrate the hair. Once this has happened it is very difficult to get it instantly completely white again. I myself have a mare with a white tail, when she came to me the tail was in yellow ringlets, it is now very white. I started by washing the tail every day for a couple of weeks, this really helped and gradually over a few weeks it regained its originally white colour. I used Gloss n Go and Super Shine Lotion after washing to reduce future stains. 1. First fully immerse the tail in a bucket of very warm water, if you can allow it to soak for as long as possible (3-4 mins is ideal) this will allow the water to really soak into the hair. 2. Spray with Polar White and massage/rub in well, from the bottom of the tail up to the dock. Leave for 3-4 mins. 3. Add Deep Purple shampoo and repeat the massage/rubbing procedure. 4. Rinse off and shampoo once more before a final rinse in very warm water. 6. 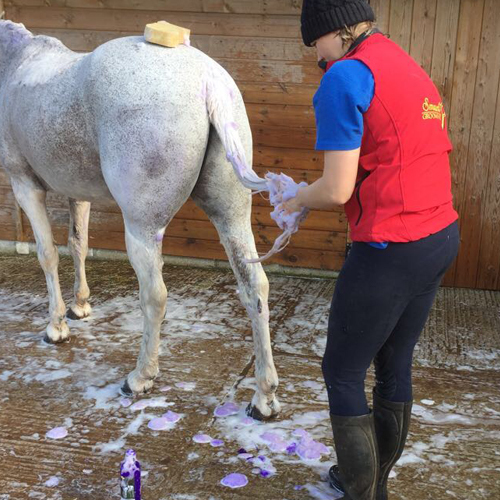 Spin the tail to remove excess water and then apply a mane and tail conditioning spray - we use our Gloss n Go or Super Shine lotion which is a more concentrated barrier lotion. This not only conditions and makes the tail easy to brush, but also provides a barrier from more urine seeping into the hair before the next wash.
7. Repeat each day for the first week to maximise results. There is always so much more work to do in the winter when looking after horses, whether they are clipped or unclipped, living indoors or outdoors. If its not mud to deal with its going to be hair. Hair when clipping and hair when grooming. There is no getting away from the fact that your horse or pony will need more attention in the grooming department during the winter months. What’s in your winter grooming kit? You may need a few extras to help so here are a few ideas to help. 1. You will need a couple stiff and medium bristled brushes for grooming the thicker winter coats. 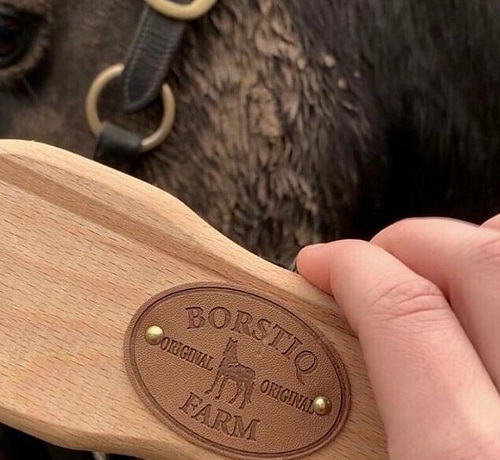 The resistance of the harder bristles are needed to get into the thick coats and to use on areas of the body and legs where dry mud may be left. 2. We favour the natural bristled Borstiq brushes which give resistance without being too hard and uncomfortable. The traditional Dandy brush was always the starter brush for grooming and made of a bassine, which is the leaf fibre of the Palmyra Palm. This is a coarse bristle, but not as harsh to use on the body as you would think. It is great to use on thick unclipped coats and on legs for removing dried mud as it gives stiffness and resistance which is necessary in tougher conditions. 3. A medium brush such as the Arenga, again made from a natural plant bristle, is perfect on clipped or finer coated horses and ponies, and really gets into the hair without causing discomfort. 4. 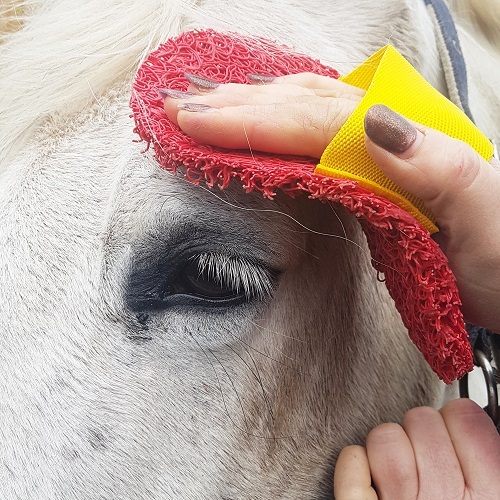 If the horse is clipped or is sensitive in any areas, it can be difficult to get thick mud removed, as harder bristles can be very uncomfortable for them. This is where the Super Groomer comes in handy. Made from reconstituted plastic, its soft but moulds to all areas of the body and head. It makes caked mud removal so easy – one to try and can be used for massaging, or with water when washing. Just apply shampoo directly on to it and then massage in for an invigorating and thorough body wash.
5. Make sure hooves are picked out every day and before riding, to make sure the hoof, frog and sole are in good condition. Apply a hoof oil or conditioner as needed and try to ensure the horse has access to a dry area to stand in for part of the day. 6. Wet and mud provide challenging times for horses that are susceptible to mud fever. This condition can prove very difficult to manage once it has started and needs careful monitoring. There are many thoughts on how to treat and your vet is the best person for advice. However, we suggest spraying with a coat sheen type spray each day before turning out, this will give some protection and will make brushing off very easy too. We also suggest using it on all body areas for repelling as well as making it far easier to brush through and for spraying prior to clipping to help blades glide through the coat more easily. This also helps to keep the edge on blades and stops them going blunt so quickly. 7. Grooming gloves are an amazing grooming accessory and help with stubborn mud and grease. 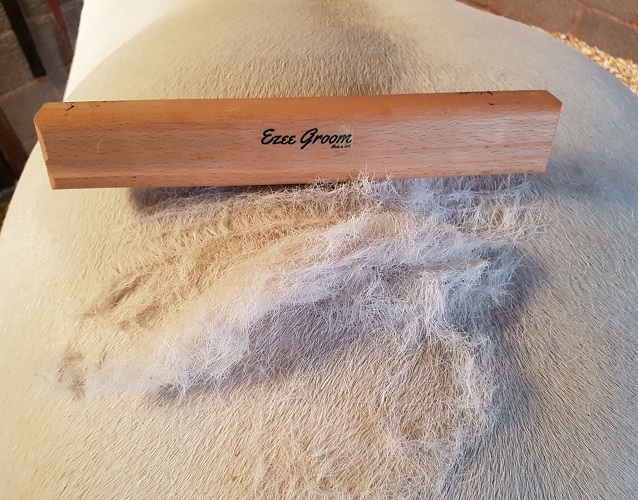 Fabulous for giving the horse a good all over massage and to check for any nicks and lumps and great in the shedding season to get rid of moulting hair and let your fingers do the grooming! 8. Clipping and trimming are a great way to keep the coat looking tidy and manageable, and certainly helps after exercise for washing off and drying very quickly. Clipping legs is open to discussion. Hair helps with protection, but also if trimmed or clipped, makes it easy to see if there is a problem and for treating if needed. Cobs are often clipped out all year round, as they tend to grow so much thick coat even through the summer and often need treating for mites, so keeping the hair short is the only option for successful treatment. 9. For cobs and other heavy types that are kept with all their beautiful long manes and tails and feather, they require regular and careful maintenance. Some feathers can even be plaited down to keep them out of the mud. Tails and manes are often plaited over too, to help keep them from becoming entangled. We recommend a slightly heavier duty lotion to apply to the very hairy areas – our Super Shine lotion is perfect for this purpose and will help to keep the hair in condition and easy to brush through. 10. Learn how to hot towel. This is great for clipped coats,and can be used for removing grease and hair after clipping, with a touch of vinegar, soap flakes or a preparation like Lavender wash, giving a relaxing and refreshing wash. Hot towelling can also be used with our Super Shine lotion to increase the shine, and again a small amount mixed with hot water and applied with a flannel all over will give a great shine. This can be applied all over, then allowed to dry. It won’t attract dust or dirt and the saddle won’t slide either! A perfect finish – a great spa treatment. 11. For stubborn stable and grass stains, keep a bottle of stain remover handy. Polar White spray not only doubles as an instant stain remover, but also a spray and wash shampoo great for regaining the whiteness after a days hunting or a week’s worth of mud. A quick fix to whiten and brighten. 12. Don’t forget to not only look after your horse but also your grooming kit too. Clean your brushes by dipping in a warm solution of disinfectant and water on a regular basis, and dry naturally, especially if the bristles are a natural product. To prevent cross infection its advisable to keep a basic grooming kit for each horse. Time spent grooming your horse in the winter months, will pay dividends. Producing a well groomed and turned out horse is a reflection on the owner’s stable management. There is nothing more satisfying then riding out on a well turned out horse. You will be noticed whether out hunting, hacking or at an event, and possibly even more noticed for the wrong reason if the end result is not well groomed!